Forwarding an extraordinary resume and suggesting that Lafave interview the Jose E. Ferraioli. 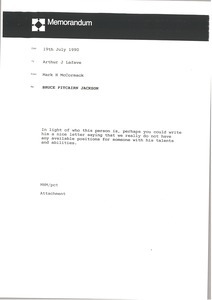 McCormack sends James H. Miller's résumé to Arthur J. Lafave Jr. 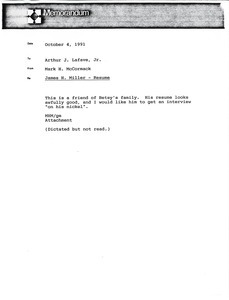 He indicates that Miller is a friend of Betsy's family and that his résumé looks "awfully good." He would like Miller to get an interview. 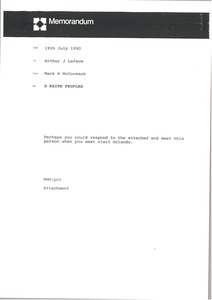 Miller's résumé is attached. 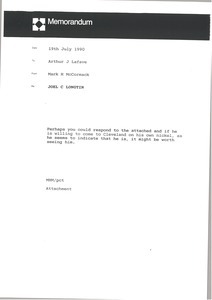 McCormack instructs Lafave to respond to Joel C. Longtin about a possible interview. 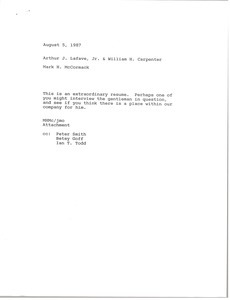 McCormack instructs Lafave to meet with D. Keith Peoples about job opportunities. 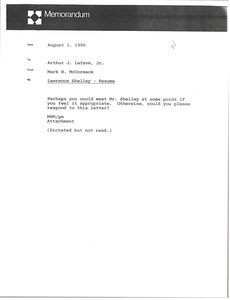 Forwarding the resume of Lawrence Shelly and instructing Lafave to meet with him. McCormack instructs Lafave to respond to Bruce Pitcairn Jackson.